Looking to buy safety rain gear in Rochester NY, Ithaca NY, and Western NY at competitive prices & with exceptional service? 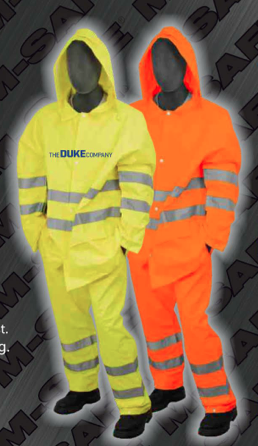 The Duke Company proudly carries the finest Safety Rain Jacket – ANSI 107-2010 Class 3 Rain Jacket in High Visibility Yellow and High Visibility Orange. Rain jacket is constructed of durable 100% polyester that is PU coated fabric. High quality attention to detail includes fully taped seams to ensure durable protection against rain. Jacket is equipped with convenient outer pockets (2) and protective hood. Meets rigorous ANSI / ISEA 107-201 Class 3 standards.